Ōkuninushi 大国主命, the Shintō kami of abundance, medicine, luck, and happy marriages. In Japanese mythology, Ōkuninushi (lit. = Master of the Great Land) built and ruled the world until the arrival of Amaterasu's grandson, Ninigi-no-Mikoto 瓊瓊杵尊. He then gave political control to Ninigi but retained control of religious affairs. In gratitude, the sun goddess Amaterasu presented Ōkuninushi with the Grand Shrine of Izumo. According to Japanese tradition, all Shintō gods meet in Izumo each year in October. October is thus known around Izumo as Kamiarizuki 神有月 (Month with Gods) and everywhere else in Japan as Kannazuki 神無月 (Month Without Gods). The Shinto kami O-Kuni-Nushi-no-Kami is also called Onamochi or O-Mono-Nushi-No-Kami. His name is often translated as "Prince Plenty" or the "Great Landlord" God. The myths about O-Kuni-Nushi come from two primary Japanese sources: the Kojiki (Records of Ancient Matters), written in 712 C.E., and the Nihon Shoki or Nihongi (Chronicles of Japan), written around 720 C.E. Lafcadio Hearn, in Japan: An Attempt at Interpretation, observes that though these manuscripts are supposed to be histories (and were taken to be such by generations of Japanese), they obviously contain a large amount of mythology. The writings come from an oral tradition passed on for many generations. O-Kuni-Nushi is known to be a god of abundance, medicine, good sorcery, and happy marriages. All these are characteristics which are reflected in the myths about him. O-Kuni-Nushi is the son of Susano-O no Mikoto, the Storm God, who was originally a Sky God, but later was sent to Earth to rule as the High God of Izumo. It is at this shrine that one finds the road to the underworld; therefore Susano-O is also called the God of the Dead. It is with the Princess of Izumo, Kushinada-Hime, or the Wondrous-Inada-Princess, that Susano-O squired a son named O-Kuni-Nushi. The adventures of O-Kuni-Nushi begin with the legend of the white hare of Inaba (click on image at left). This hare appeals to the eighty brothers of O-Kuni-Nushi for help. The hare has been skinned by a group of vicious crocodiles, when he asks O-Kuni-Nushi's brothers for help and they tell him to bathe in the sea and to dry off in the wind. This causes severe pain for the Hare. Later, the hare meets O-Kuni-Nushi, who feels sorry for the animal and tells him to bathe in fresh water and then to roll in the pollen of sedges lying on the ground. After this the Inaba Hare is completely cured. In thanks he proclaims that the Princess Yamato is to go to O-Kuni-Nushi, not to his brothers. His brothers are angry with this and kill O-Kuni-Nushi, which they succeeded in doing, but his mother and the goddess Kami-Musubi manages to resurrect him (Giraud 409). 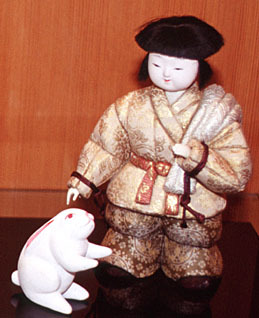 In this case, the myth of the hare and O-Kuni-Nushi shows the valuable lesson of kindness. The hare in the story seems to have some special power because he is able to grant Princess Yamato to O-Kuni-Nushi. This suggests the hare may have been another kami in disguise or at least that the hare had an unexpected power over their lives. Therefore, one should not judge others by the outward appearance because you do not know what powers lay inside the creature. This aspect of the myth reflects the idea that one should try to help even those beings that do not seem that important. The eighty brothers may represent the view of society as a whole thinking that something as small as a hare is of no real importance, which results in their making a game out of the hare's painful experience. O-Kuni-Nushi shows that all creatures deserve kindness. The fact that O-Kuni-Nushi's mother saves him also shows the theme that good will prevail over evil. Lafcadio Hearn, drawing on the Nihongi, retells the story of the relationship between O-Kuni-Nushi and his wife Yamato-toto-hi-momo-so-bime no Mikoto. They were married in the nighttime and Princess Yamato had never seen her husband. She begs him to delay in the morning time so that she may see the majesty of his beauty. O-Kuni-Nushi responds that in the morning he will enter her toilet-case and wait for her and that he hopes she will not be alarmed. Princess Yamato wondered about what this could mean and in the morning she looked into her toilet-case and saw a beautiful snake, about the size of the cord of a garment. This frightened her and caused her to exclaim in shock. O-Kuni-Nushi was ashamed and quickly turned into human form saying to his wife: "Thou didst not contain thyself, but hast caused me shame: I will in turn put thee to shame." After this he ascended Mount Mimoro. Princess Yamato looked up with remorse and fell down onto a chair. Using a chopstick, she stabbed herself and died. She was buried at O-chi, by men during the daytime and by Gods at night, with stone from Mount O-saka (31). Other traditions have O-Kuni-Nushi being sent straight to the underworld after his brothers tried to kill him in order to avoid their revenge. In the underworld O-Kuni-Nushi met Suseri-Hime, the daughter of the god of the underworld. They were married, but first Susano-O made O-Kuni-Nushi pass three tests. The first test was to put him to sleep in a room of snakes. O-Kuni-Nushi saves himself with the scarf that Suseri-Hime gave him. The next night he had to sleep in a room full of centipedes and wasps, but he again used another scarf that Suseri-Hime had given him to protect himself. The final test that Susano-O gives him is to find an arrow, which Susano-O had sent into the middle of a huge meadow. When O-Kuni-Nushi is in the middle of the field, Susano-O set fire to the grass, luckily however; a mouse saves him by showing him an underground room. The mouse then brings the arrow to O-Kuni-Nushi. O-Kuni-Nushi's success helps Susano-O to feel more at ease with him, so he has O-Kuni-Nushi wash his hair and finally goes to sleep. O-Kuni-Nushi then ties Susano-O's hair to the rafters of the house and with his wife on his back fled. He also took with him Susano-O's sword, bow, arrows, and his Koto (harp). Susano-O is awakened when the Koto brushes against a tree. In the time it took for Susano-O to free his hair, the two were far away. From the slopes of the underworld, Susano-O advises O-Kuni-Nushi, whom he sees in the distance, to use the weapons to fight his brothers, foretelling that O-Kuni-Nushi would conquer them and reign over the world. He also asked O-Kuni-Nushi to make Suseri-Hime his main wife and to build a palace at the foot of Mount Uka. 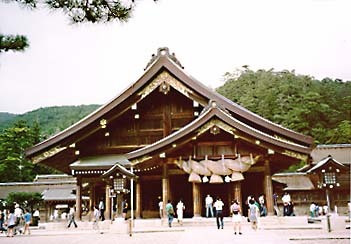 O-Kuni-Nushi is still worshipped today at the Grand Shrine of Izumo (click on image at right). Originally, it was Susano-O that was the Kami of this shrine, but later it was dedicated to his son O-Kuni-Nushi as well. This is one of the most famous shrines in Japan, celebrating the spirit of union and compromise. Susano-O, as the brother of Amaterasu, was officially of the Yamato line. In marrying the Izumo Princess, he helped to bring the two clans together. O-Kuni-Nushi, in turn, married a another Yamato Princess, thus reinforcing the ties between the Izumo and Yamato clans. Many people come here pray to O-Kuni-Nushi, the "Celestial Matchmaker," seeking happiness in love and marriage. Others ask for increased harmony and understanding within their existing families. The original structure, dating back to the Nara period, once towered some 157 feet high. Its dimensions were drastically reduced in the Kamakura period, and it was reconstructed several times since then. The building which survives today, dating back to 1774, is 82 feet high. Hanging in front is the straw rope called shimenawa, which indicates the sacred area within which the god resides. The shimenawa at Izumo Shrine is one of the largest, measuring 40 feet long and seven feet thick at the widest point. Guirand, Felix. "Japanese Mythology," in New Larousse Encyclopedia of Mythology. New York: Prometheus Press, 1959. Hearn, Lafcadio. Japan: An Attempt at Interpretation. Richmond, Vermont: Charles E. Tuttle Company, 1904.